This website tells the story of Dr Barry Cotter, the first doctor in Melbourne and his wife, Inez Seville Fitzgerald. It is written mainly for their descendants, especially those who have the surname Barry-Cotter. But family or not it’s a great story, full of action and adventure, infidelity, tragedy and betrayal, with characters and events that need no fiction to enhance them. You can find out more about how the website came about by clicking here or go straight to the biography by clicking here. The original website, moiramcalister.com was archived by the National Library of Australia into their Pandora Collection on May 29th, 2015. To view that website, click here. Hobart Town on the River Derwent, Van Diemen’s Land (1830) by W. J . Huggins (with permission from Tasmanian Archives and Heritage Office). 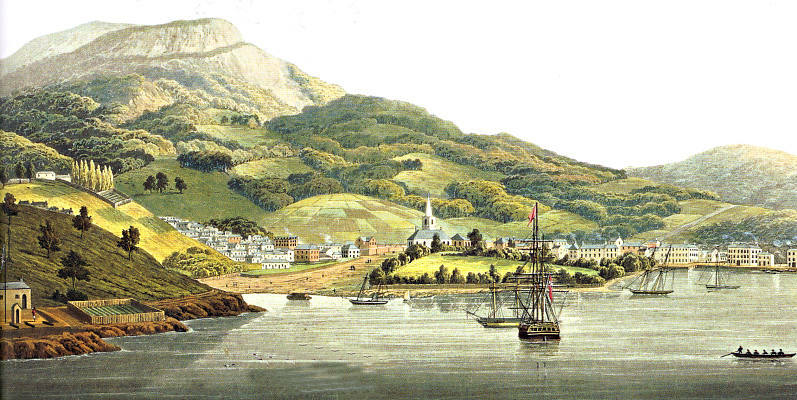 This is how Hobart looked when Dr Cotter arrived in 1830. My ancestor James Thomas Leslie sailed on the Juno with Dr Barry Cotter from Liverpool in 1830. He was employed by Barry Cotter on arrival in VDL. Can you provide any further information about their relationship? James was born in Dublin in 1812 and was sent out to Australia in 1830 as a remittance man. He married Margaret McCarthy from Cork in Hobart Town in 1833. Hello. My name is Michael Joseph Cotter. My father is William reynold Dennis Cotter 20/ 10 /1946. His father was Joseph Lennox Cotter. I am told we are direct descendants of the Dr. BARRY COTTER. Can you help us to understand More? ?